Ridge walking in the Black Mountains. 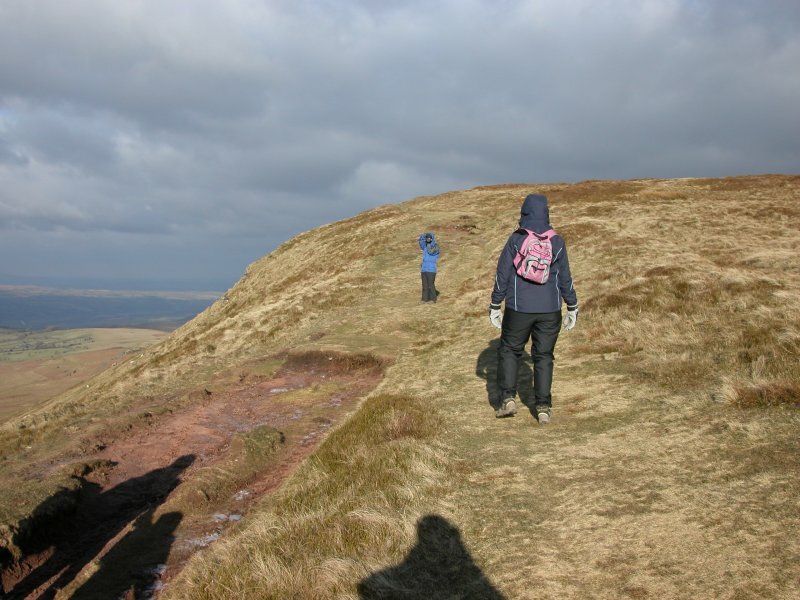 Hay Bluff is a steep buttress at the north edge of the Black Mountains, overlooking the town of Hay-on-Wye. 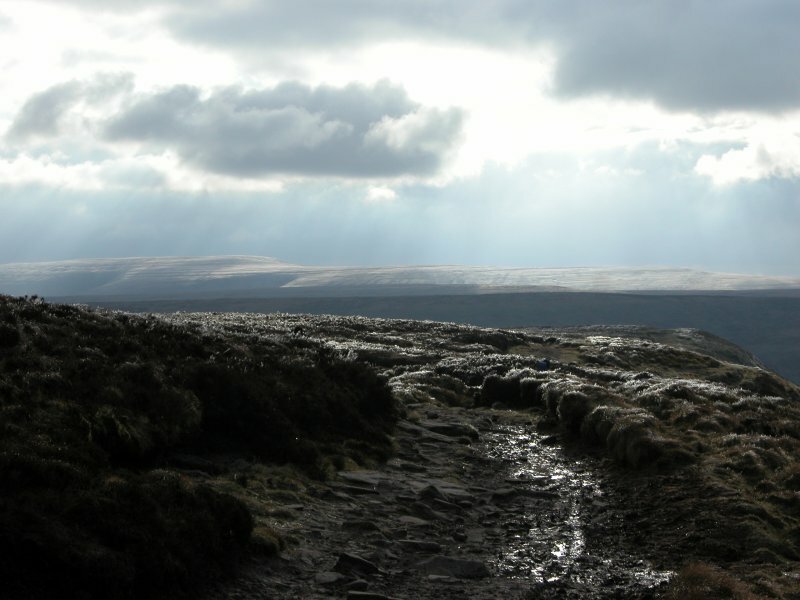 It is the end of the eastern-most major ridge of the Black Mountains, which contains only two mountain summits; Black Mountain (703 metres), and the Black Mountain South Top (637 metres). 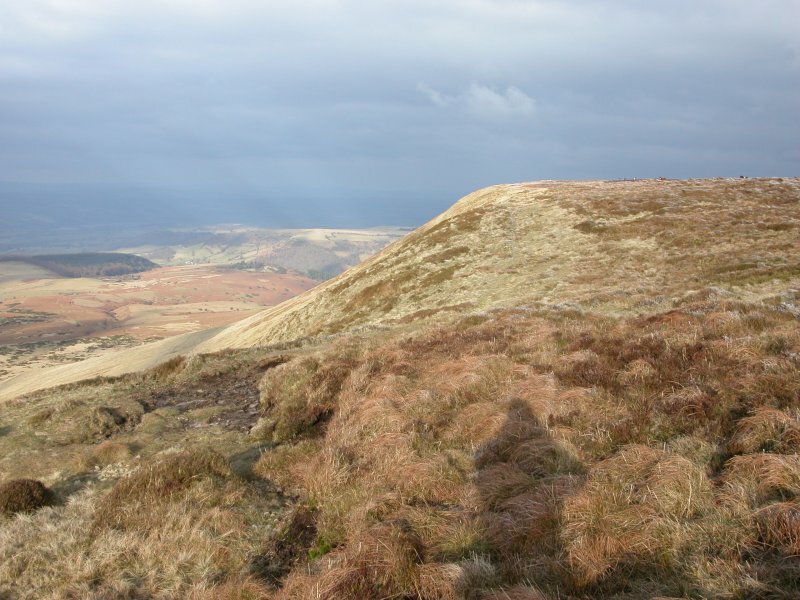 At the other end of the ridge is Hatterall Hill (531 metres). 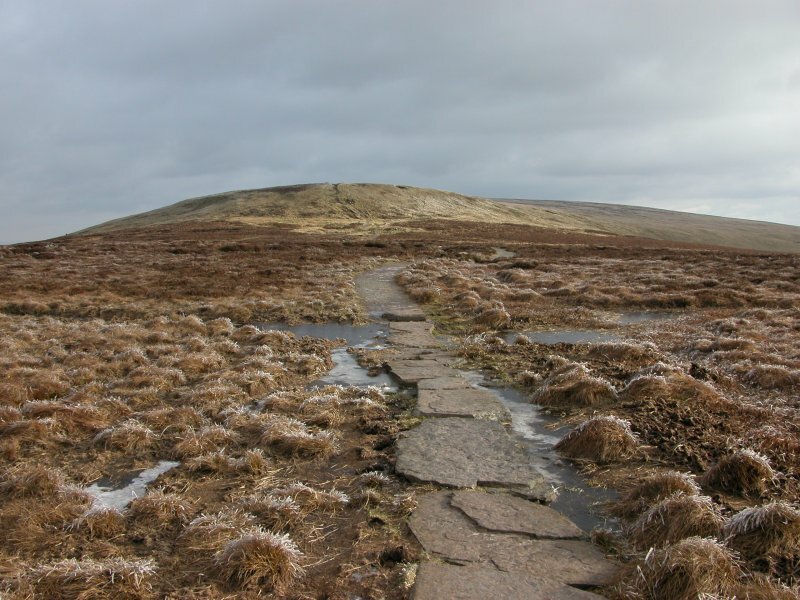 Hay Bluff is 677 metres high and its face is impressive, but as it only has just under 11 metres of prominence, it is relegated to being just a buttress of the Black Mountain. Black Mountain (the peak in the Black Mountains, not The Black Mountain range at the other end of the park) sits on the border between England and Wales, and is the highest point in South England (the nearest higher point in England being as far away as the Yorkshire Dales), and along its ridge is the 1200 year old Offa's Dyke defensive earthwork, which separated the local English and Welsh kingdoms (Mercia and Powys). 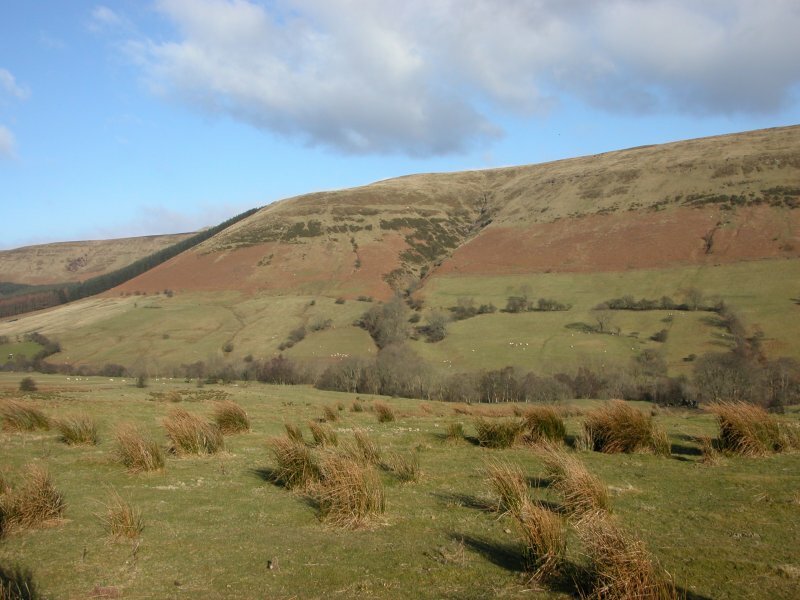 Within Wales, there are 4 taller peaks within the Black Mountains alone, another 11 within the rest of the national park, a further 3 within Mid Wales and 65 within North Wales. The tallest are taller than anything in England. 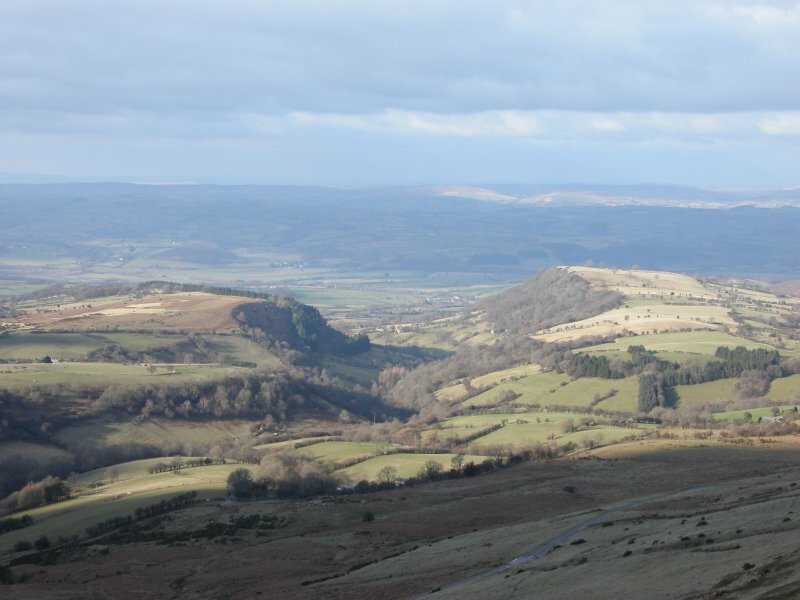 So while I am sure the Black Mountain is impressive for South England, it is very much overshadowed on the Welsh side, where it does not even earn itself a printed name on the map. 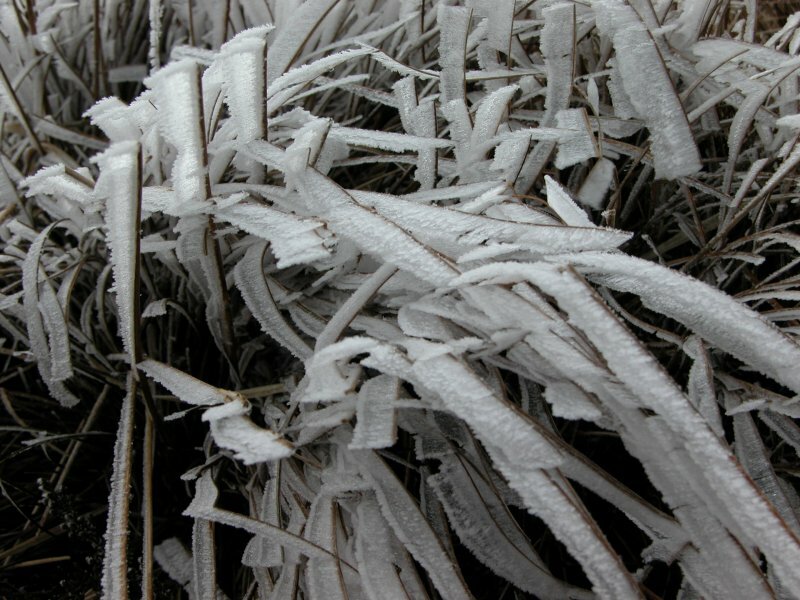 The weather was very cold and windy, with the freezing point at 400 metres (and the icy patches on the road seemed to agree), and snow predicted later. 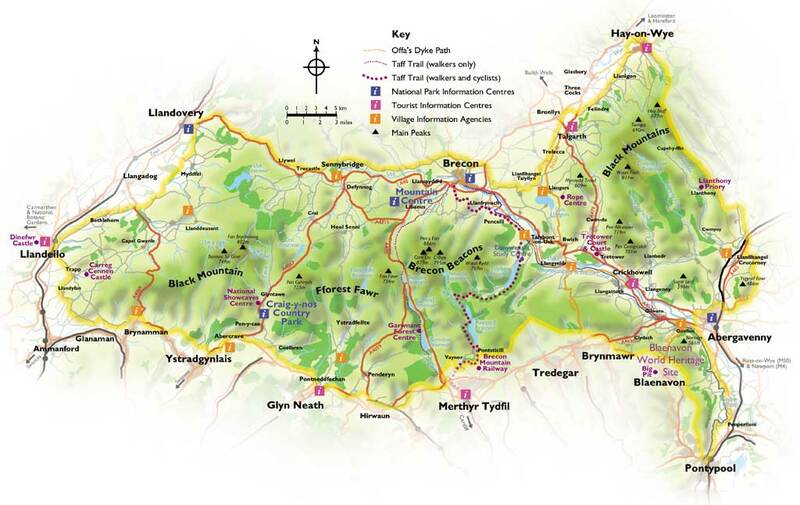 Map of the Brecon Beacons National Park, showing the locations of the various mountains and ranges. The Black Mountain, seen from the Welsh side. 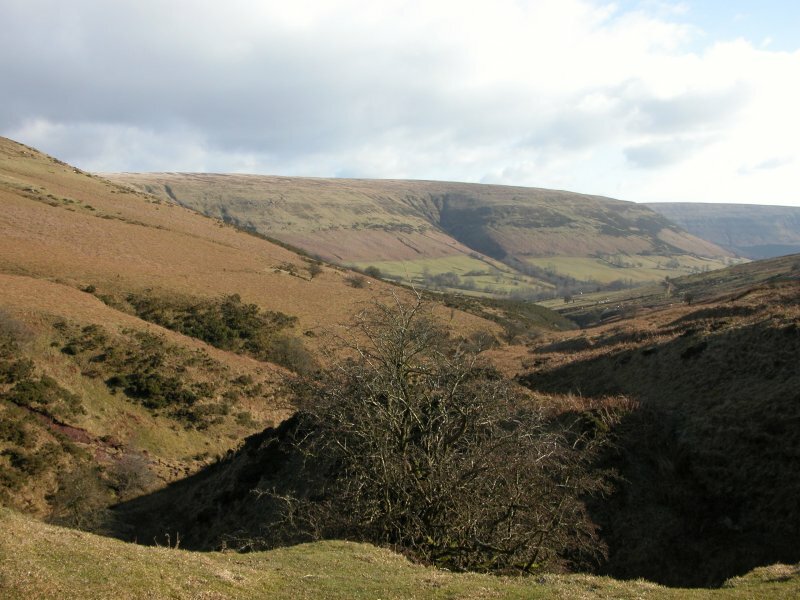 The beautiful U-shaped valley is called the Vale of Ewyas, and is occupied by the Honddu (Hon-thee) river. 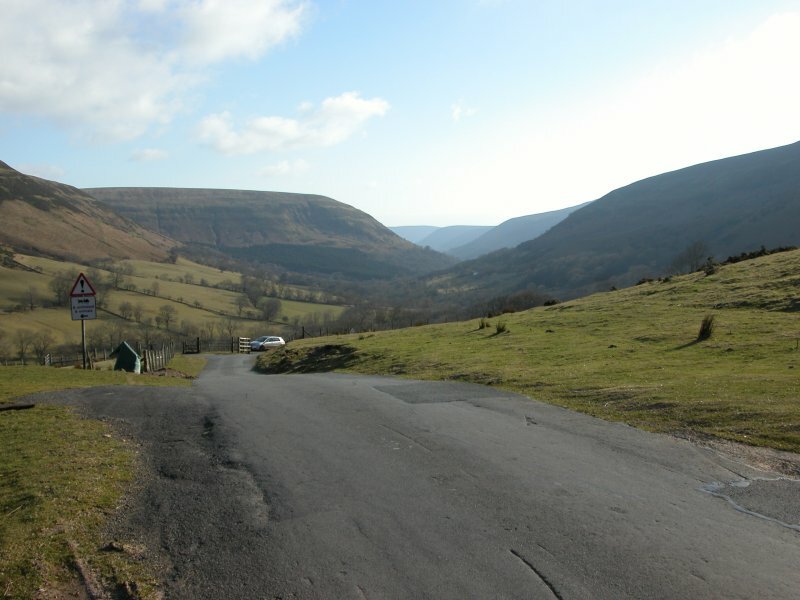 Vale of Ewyas, taken from Gospel Pass, at the head of the valley. 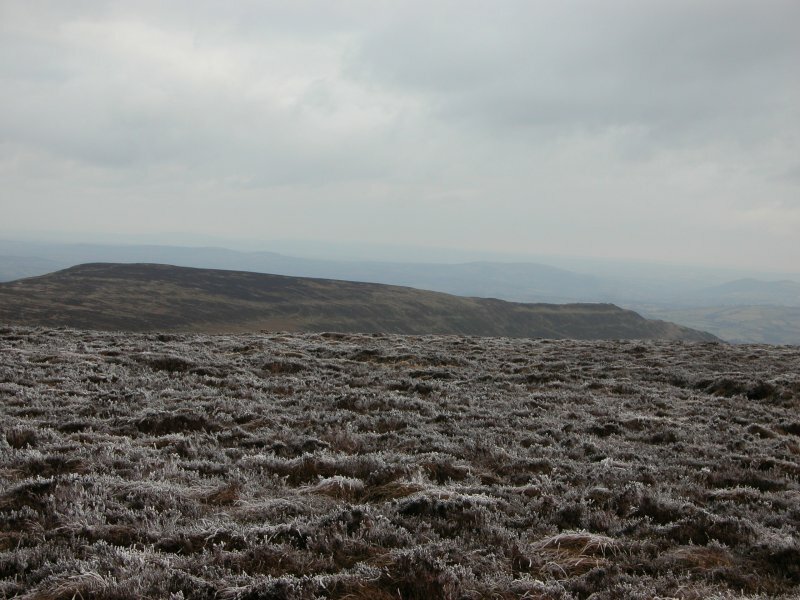 The slopes on the left are Hay Bluff, and the ridge ahead is the Black Mountain. Taken from the car park, at about 540 metres. 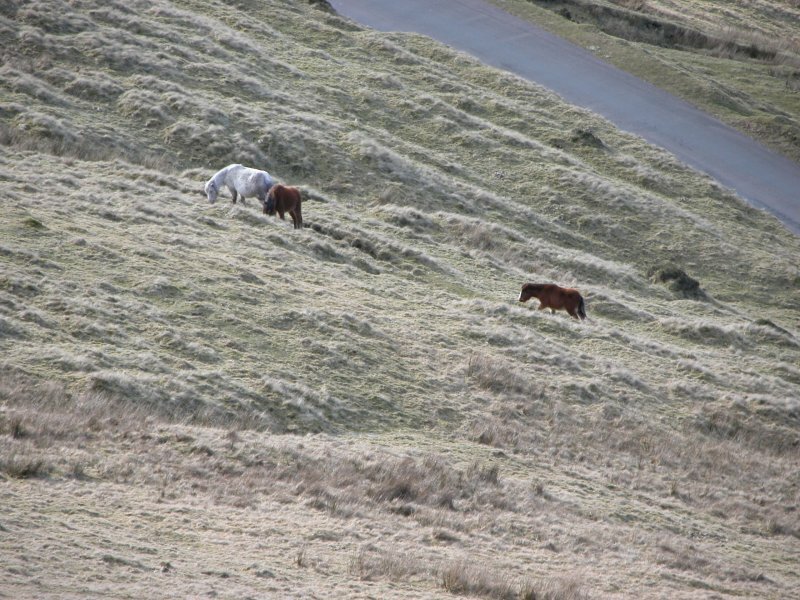 Wild ponies on the lower slopes. Sunlight playing on the sides of Digedi Brook (Bomb Digedi? ), looking into the Wye Valley. The bluff of Hay Bluff. 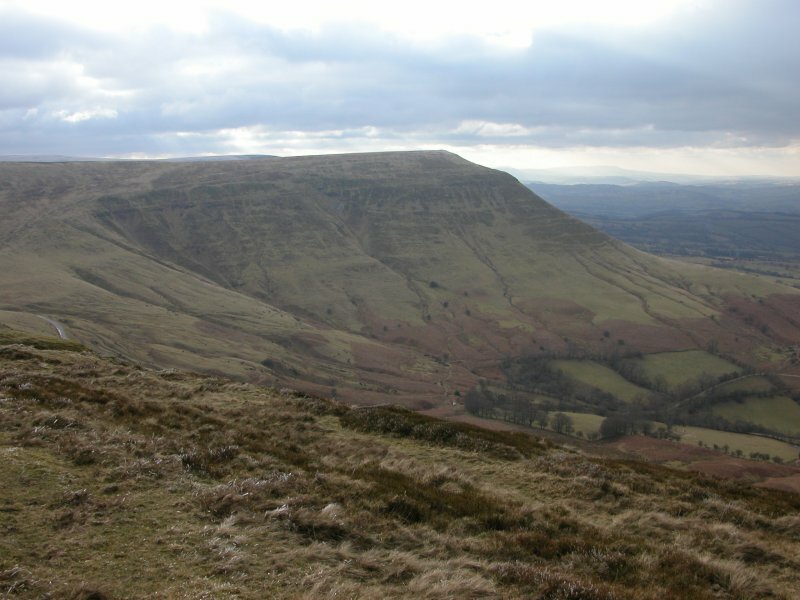 Pen y Gadair Fawr, the second tallest peak in the Black Mountains, and fifth tallest in the Brecon Beacons National Park, at exactly 800 metres. The light was playing games with this mountain, and it was very difficult to get the camera to see it at all, let alone get a reasonable picture. Looking over Gospel Pass to the eastern side of Lord Hereford's Knob (690 metres), Hereford being a nearby city in England. Apparently, the Welsh didn't think so much of his lordship's knob, and said it was just a little tump; Twmpa. Both names are used, so neither is the more correct form, but the English name is usually better known, if nothing else, because of its humour value. The Welsh name is the more commonly written one, to avoid having to have a potentially offensive word in writing. 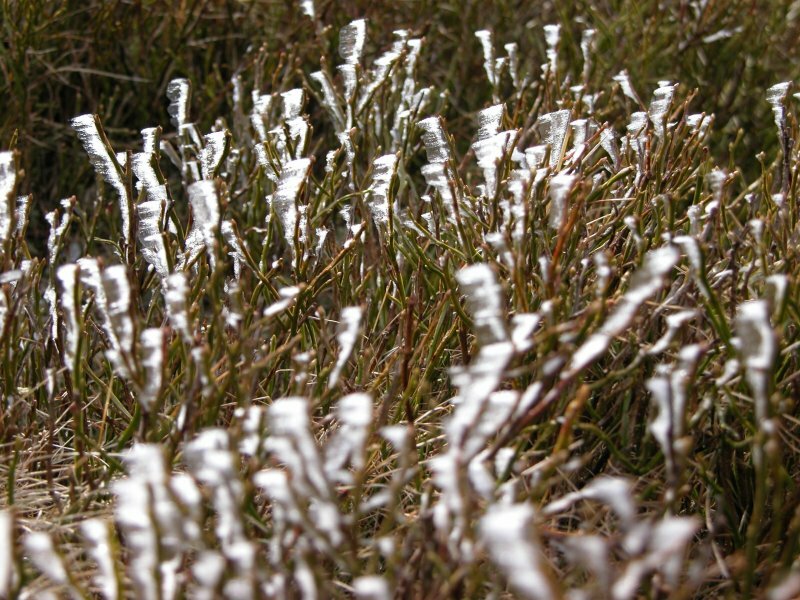 Windblown ice on the bilberry/wimberry bushes. 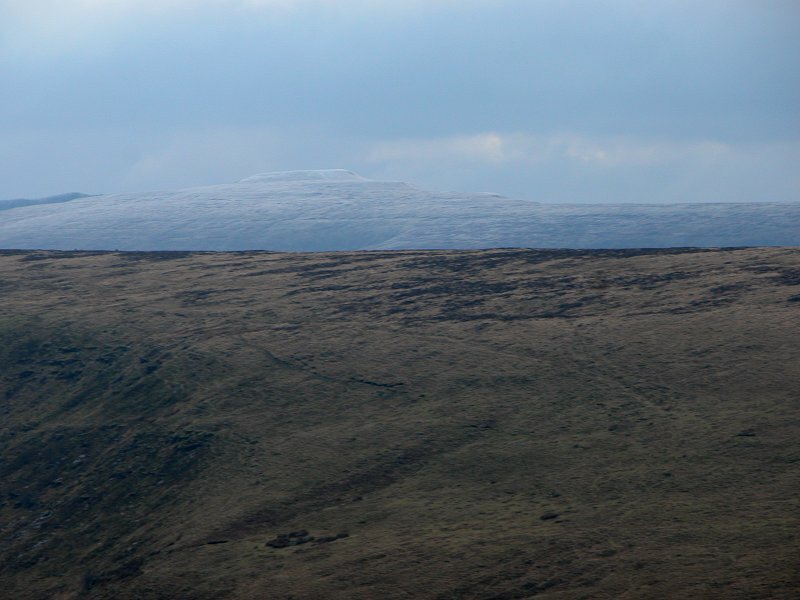 Looking over the Darren Lwyd ridge of Lord Hereford's Knob to the frosted top of Waun Fach, the tallest peak in the Black Mountains and third tallest in the Brecon Beacons National Park, at 811 metres. Indistinct and boggy. But tall. Sun streamers lighting up the full national park. 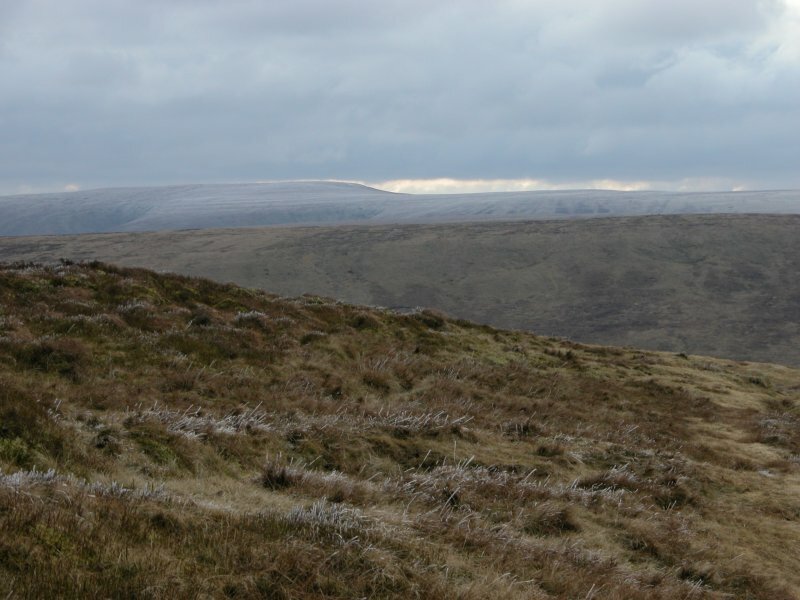 From the Black Mountains on the left, past the Brecon Beacons and Fforest Fawr, to the Black Mountain on the right. Lord Hereford's Knob is the one on the left, then Pen y Fan (886 metres) is the obvious tall mountain, followed by Fan Gyhirych (725 metres) peering over the Fan Frynych (629 metres) buttresses, and lastly Fan Hir (761 metres) and Fan Brycheiniog (802 metres). The white spec is the trig point on the summit of Hay Bluff. 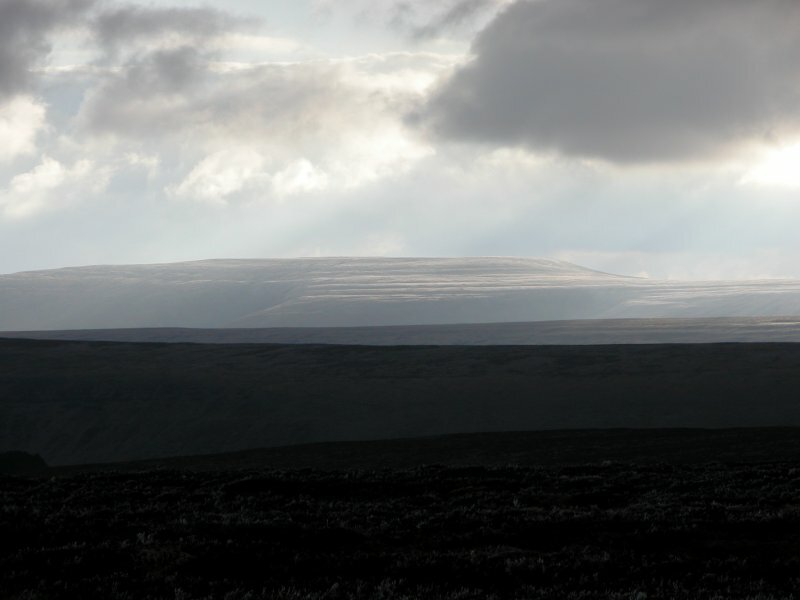 Sunlight playing on Waun Fach, and lighting up the ice on Hay Bluff's ridge. The upper section of Black Mountain. It's missing most of the drama of the steeply sliping sides, and from up here, it hardly feels like it has any height at all. 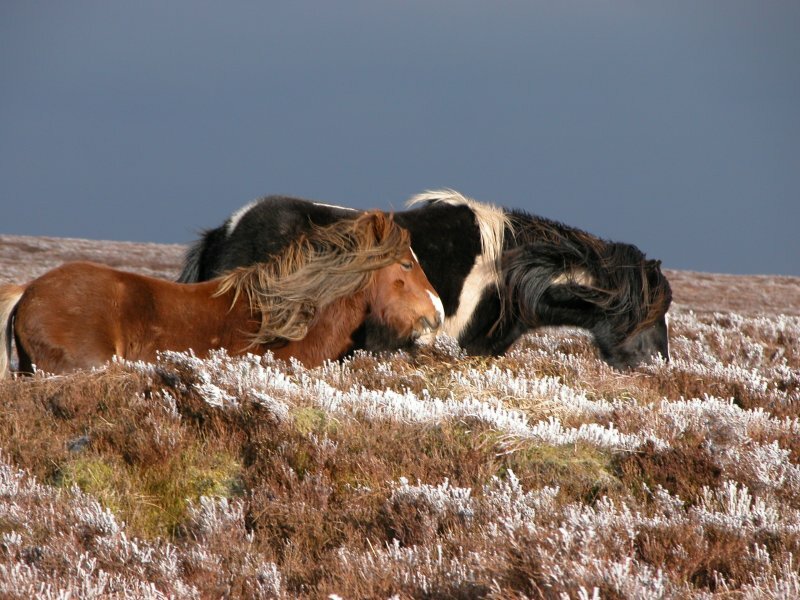 Nuzzling ponies. 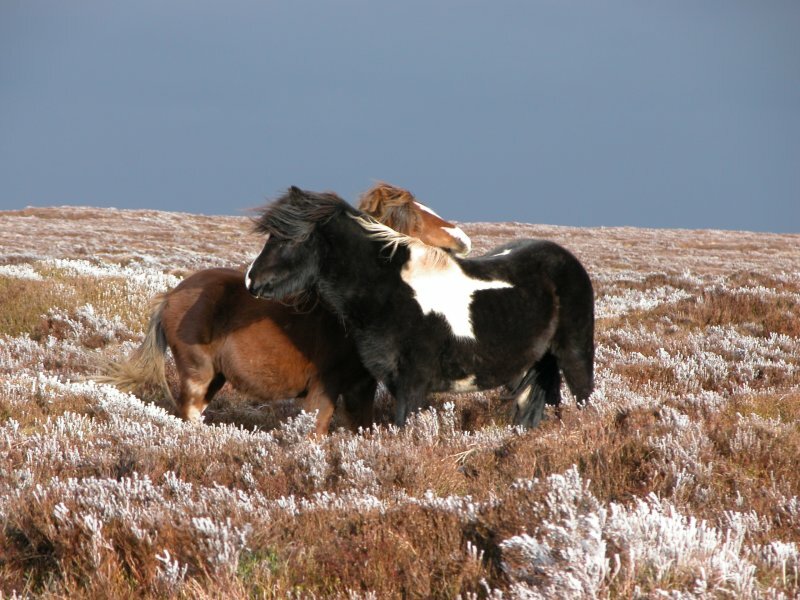 The larger of these is not a native Welsh breed. 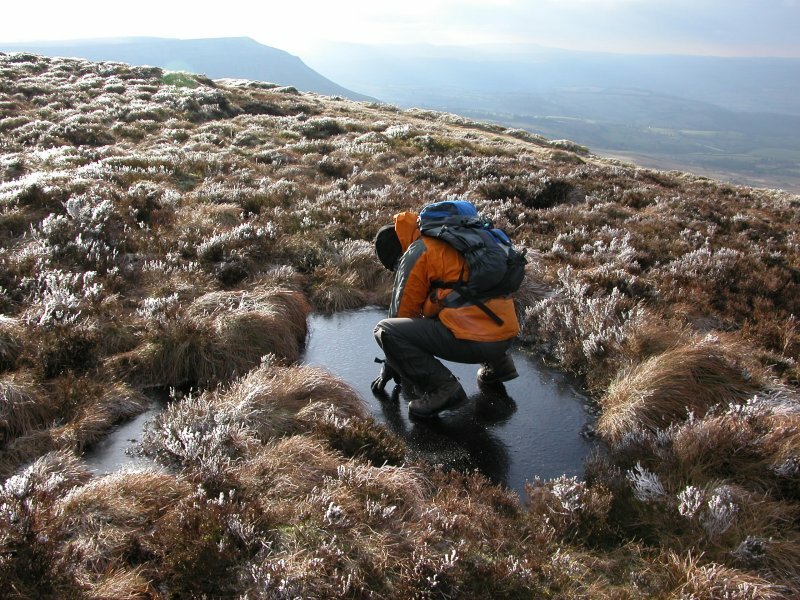 Wading through the icy heather. 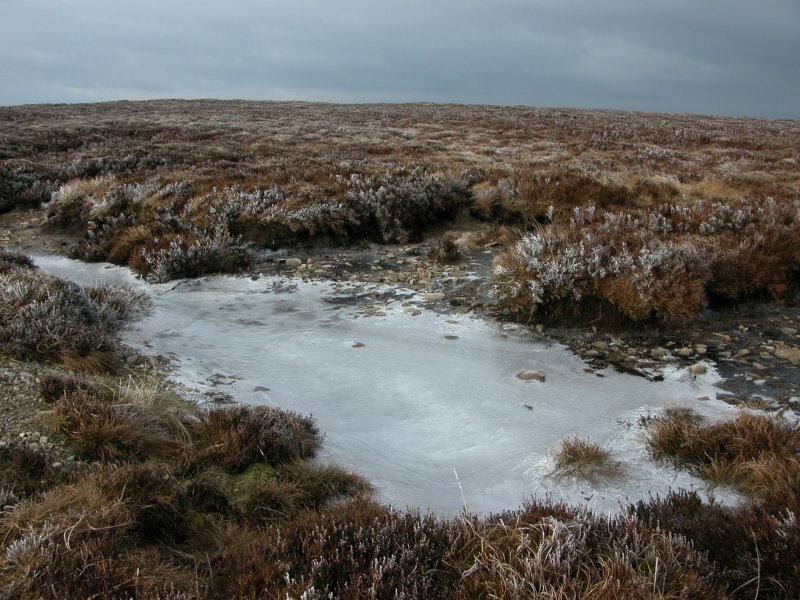 Normally this would be boggy, but today it's covered in sheets of ice. Testing the strength of the ice. Another ice sheet coped until he started jumping, but it was already re-freezing just half an hour later. 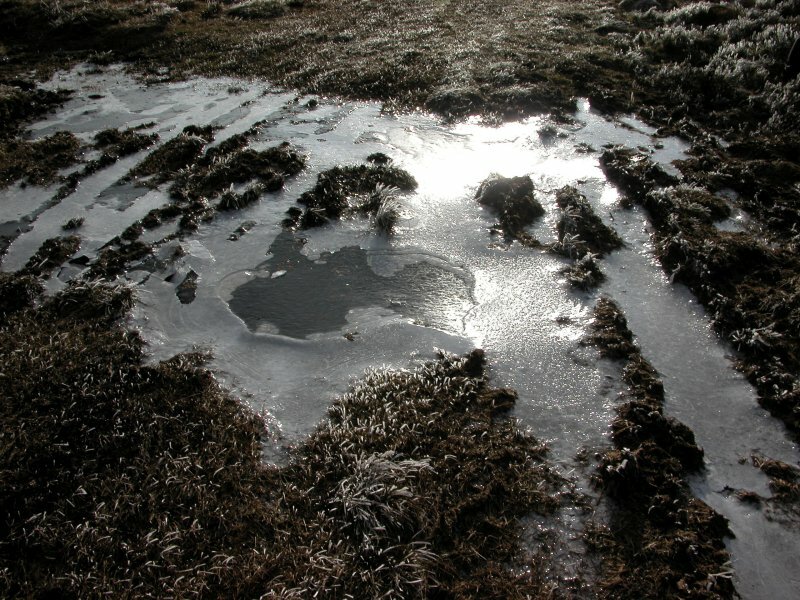 Icy ponds. As expected, nobody else wanted to go any further. It had taken 45 minutes to cover just 2 km to get to the trig point (blame the small child, and the cameras), and the proper top was another 2 km away. Sunset was due in just 1¼ hours. So I went on my own, part jogging (really shouldn't do that) and part walking - turns out I managed the 2 km there and back in just 30 minutes. 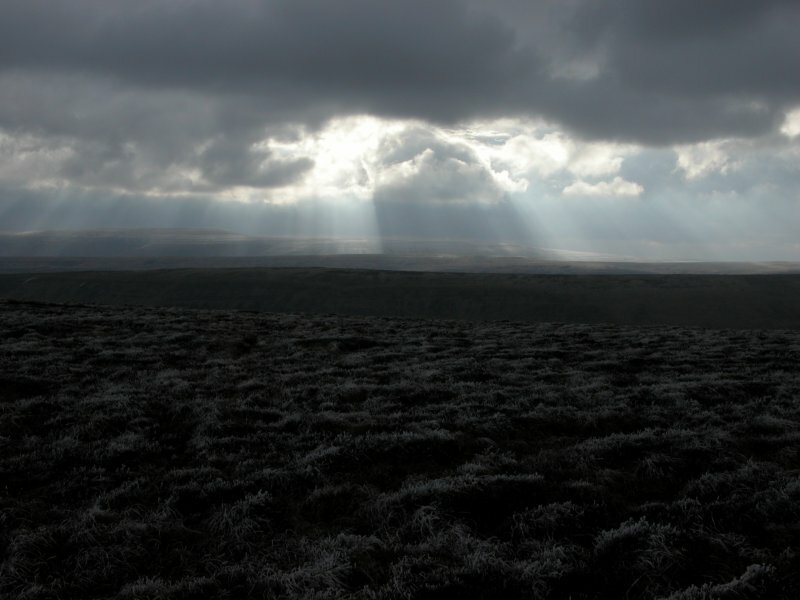 Sun streamers over the Black Mountains. The small climb up the Black Mountain. At the base of this rise, a path joins from the left, marking the invisible Offa's Dyke, and the border with England. It's a pity the dyke is not visible here, but then, who needs to build a 2.5 metre tall ditch and mound when there's a 700 metre high natural ridge instead? And still more streamers playing over the Black Mountains. 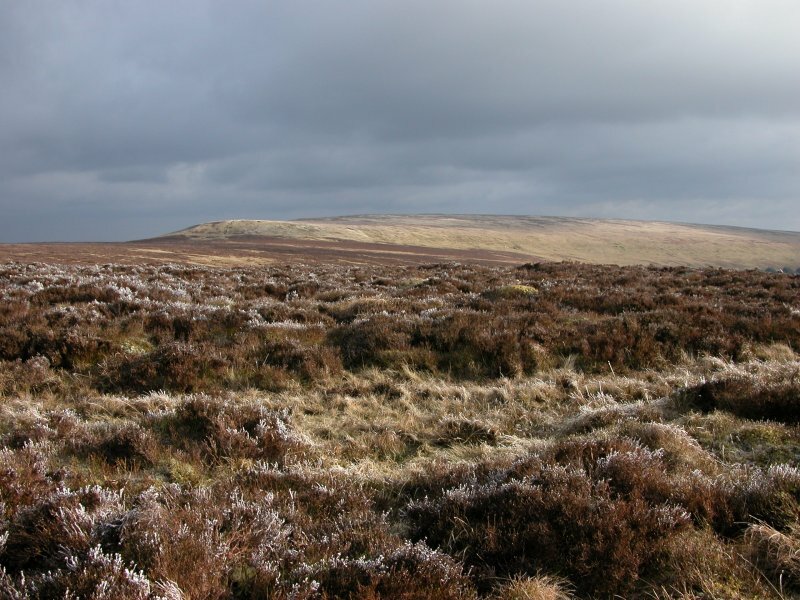 Black Hill, one of the ridges extending into England. Its name is a misnomer, since it is 640 metres tall, which would qualify for mountain status, but its prominence of less than 10 metres means it does not qualify as either a hill or a mountain. Just a side-ridge, though it does look nice. 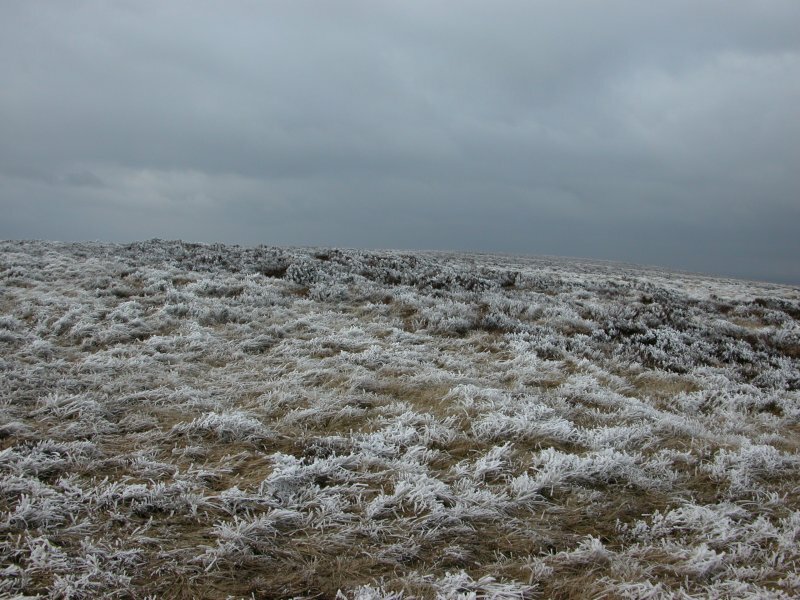 The top of Black Mountain is completely unmarked, and impossible to work out where the highest point is. The 1:50'000 maps show a spot height at the location on the path shown at the top-left of this picture, as located by the GPS, so whether or not it is the highest point (it can't be more than 50 cm out, given the complete lack of features here) it is the top. Right. Been there, seen it, done it. The view is not great, as it's blocked by the sides of the mountain itself. 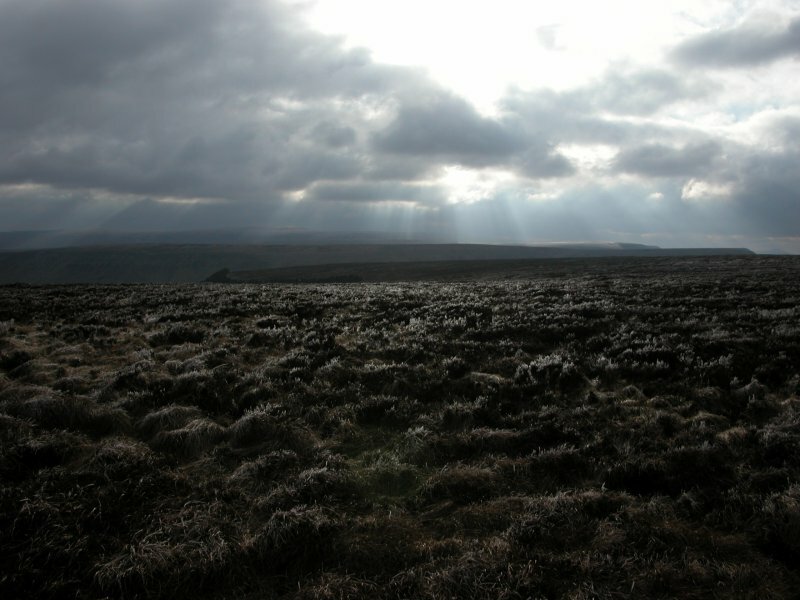 A final view of the light playing on Waun Fach, seen over the ridges of Black Mountain, Hay Bluff, Lord Hereford's Knob and Rhos Dirion (713 metres). 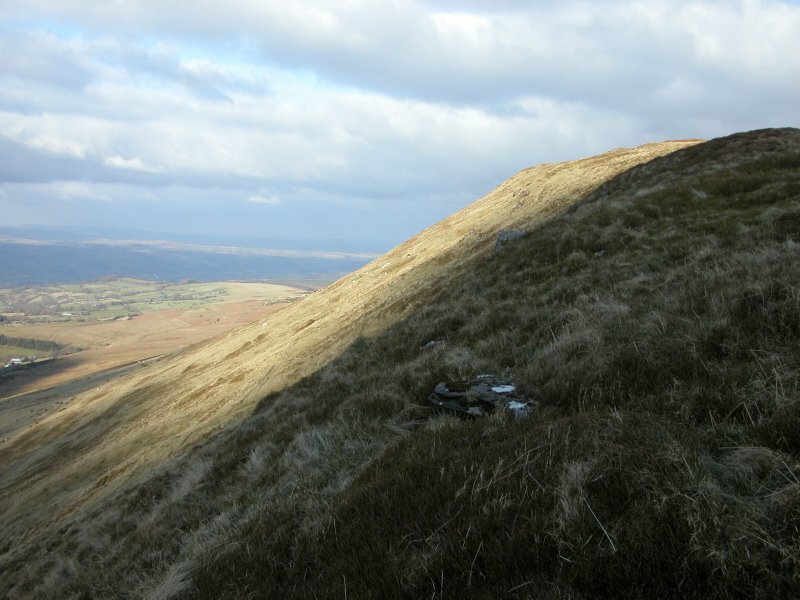 Chwarel y Fan (679 metres), the other summit on the Rhos Dirion ridge.